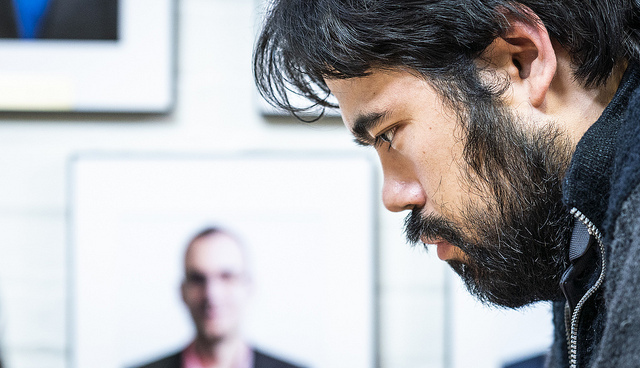 Hikaru Nakamura still leads the US Chess Championship after beating Varuzhan Akobian in Round 7, but he can’t relax at the top with Fabiano Caruana and Leinier Dominguez breathing down his neck just half a point behind. 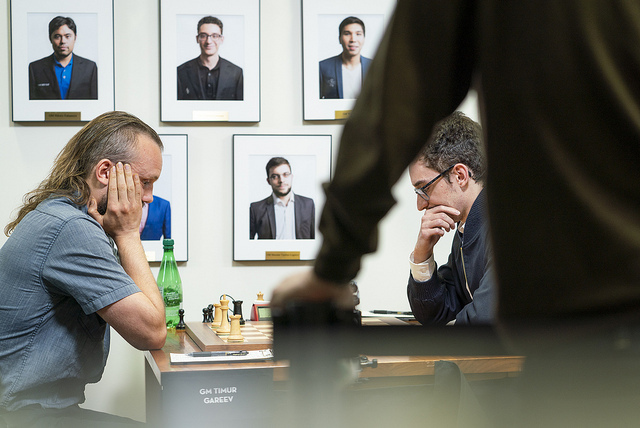 They’re joined by Sam Sevian, who demolished Ray Robson in 25 moves with the black pieces. 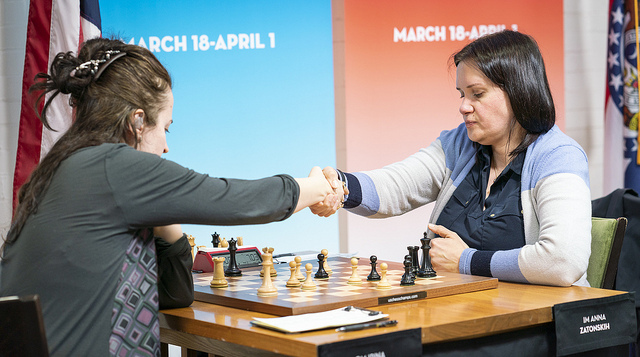 In the women’s event it seemed as though Anna Zatonskih would take over the lead until Jennifer Yu yet again pulled off an unlikely win to move to 6.5/7. 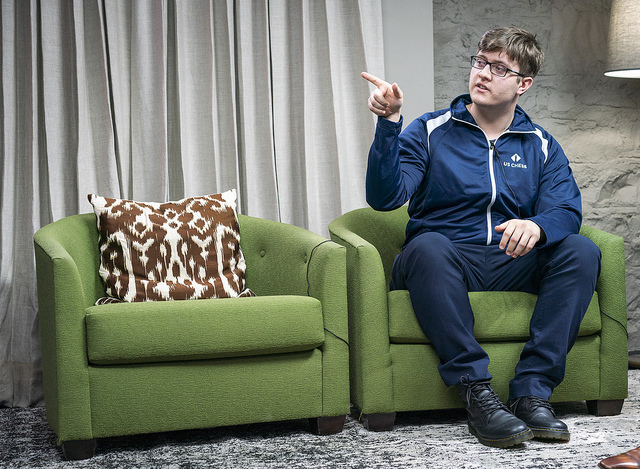 Hikaru Nakamura and Fabiano Caruana both faced opponents they felt they needed to beat in Round 7, but the way they approached the games couldn’t have been more different. Hikaru took the “classical” approach, playing a somewhat dubious system with 1…d6, 2…g6 to get an unbalanced game against Varuzhan Akobian, who had lost his last two games. There was a modern twist on that approach, though, since Hikaru had prepared the line deeply with a computer and also knew where the computer overestimated White’s position. He didn’t blink for 14 moves, but then began to use plenty of time as it seemed Akobian was on the verge of solving his problems. He never did, though (Nakamura mentioned 20.Bxe4?! instead of 20.Nxe4 as the key mistake, while the computer still thinks 21.Nb5! might have held the balance), and White was a pawn down in a difficult ending. The last straw came after 39.a3?! 39…d4+! Akobian understandably didn’t want to trade the d4-pawn for the b3-pawn and played 40.Kc4, but some offers can be refused! 40…d3! 41.Kc3 d2! and White had to take. The rest was just agony. 66…Rdxa4! was winning. 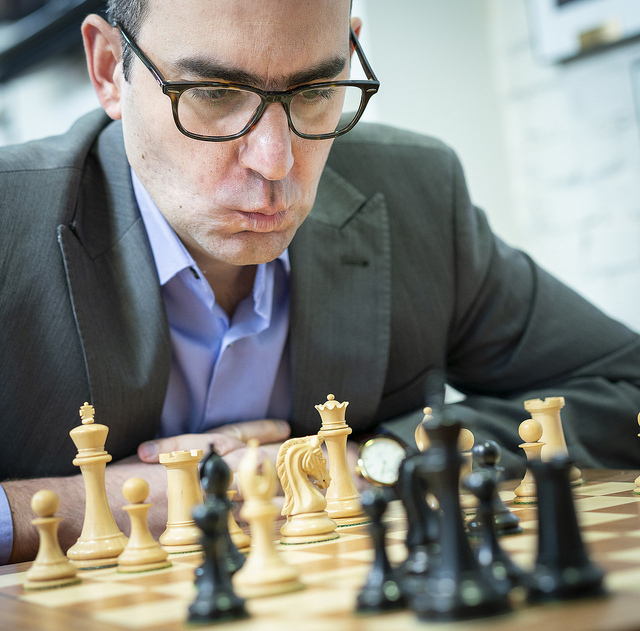 Caruana commented of that move that it “looks counterintuitive – you should be mating not grabbing a pawn - but the point is not the pawn but Ra1”. Indeed, after 67.Bxh3 (e.g. 67.Be2 also loses the bishop to 67…R4a3 68.Kf1 Re3!) 67…Ra1! 68.Kd2 Rxb1 69.Rxb1 the bishop falls. Caruana quickly played 66…Rd5? instead, since he thought it was winning, but later confessed, “I missed so many moves, it’s embarrassing, I don’t know where to start!” He’d thought, like Yasser initially, that after 67.Bxh3 he could play 67…Re5+ 68.Kf1 Bc4+ 69.Kg1 Rg5+ with mate, but in fact 70.Bg4 defends everything there. In the game 67…Rh5 was met by 68.Bg2!, and although Black does pick up the bishop with 68…Rxh1+ 69.Bxh1 Rh2 it turns out that all he could force was a theoretically drawn Rook + Bishop vs. Rook ending. 122.Rh5! was essential to stop a check on b5, while in the game after 122.Rg3? Rb5+! there was no longer any escape. It ended 123.Ka4 Rh5 124.Rf3 Rh1 125.Ka5 Rh6 White resigns. Timur was still 12 moves short of being able to claim a draw by the 50-move rule. 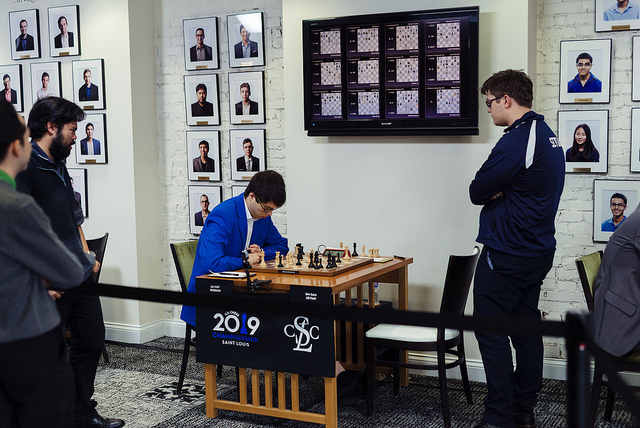 That second win in a row kept Caruana just half a point behind Nakamura, where he was joined by Leinier Dominguez, who has shown no signs of rust in Saint Louis. He also moved to an unbeaten +2 by grinding down Aleksandr Lenderman. Wesley So is a full point point behind the leaders after being held to a draw by Jeffery Xiong, while defending champion Sam Shankland was once again frustrated. 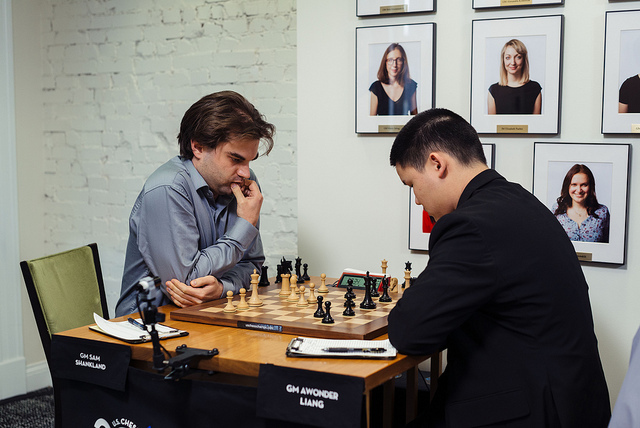 This time just when it seemed Sam’s pawn-play mastery might see him gain a winning advantage, 15-year-old Awonder Liang managed to build a fortress. 31…Ra2! 32.Qxa2 (32.Rb2 Rxb2 33.Qh2+ doesn’t help) 32…Qh2+ was the final blow. 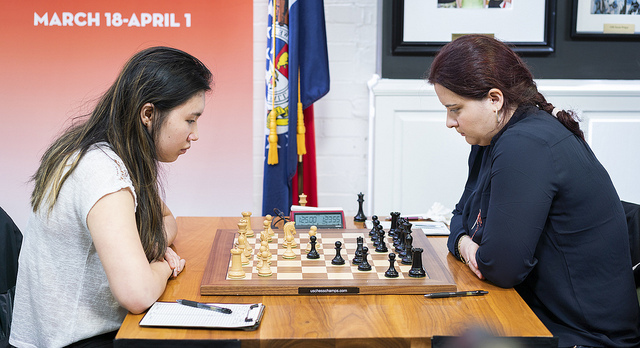 Meanwhile Jennifer Yu had squandered a big opening advantage against Sabina Foisor and was in serious danger of losing, but then the game turned again and when Sabina decided to play on instead of taking a draw by repetition it was all the help Jennifer needed. She confidently demonstrated the power of pawns supported by a bishop pair and went on to take the full point and move to 6.5/7! Black is defenceless against a slow moving attack: 38…Qh8 39.h5! Bc6 40.h6 Be4 41.Qg7+ Qxg7 42.hxg7+ Kg8 43.Bxe4 and Black resigned since the rook or bishop will give mate in 4 moves.